Richmond, VA––The Virginia Museum of Fine Arts is pleased to announce the 2019–20 recipients of VMFA fellowships. Twenty-eight students and professional artists were selected from 753 applicants to receive a total of $167,000 towards professional advancement in the arts. Since the VMFA Fellowship Program was launched in 1940, the museum has awarded nearly $5.8 million to more than 1,350 professional artists, art students and graduate students from across Virginia. Recipients must be Virginia residents and can use the award as desired, including for education and studio investments. Each year, professional curators and working artists serve as jurors to select fellowship recipients. VMFA awarded 12 professional fellowships of $8,000 each this year. Professional fellowship recipients are Mahari Chabwera, painting, Richmond; Eric Cowan, sculpture, Radford; Lily Cox-Richard, sculpture, Richmond; Soomin Ham, photography, Alexandria; Patrick Harkin, new and emerging media, Richmond; Rob McDonald, photography, Lexington; Jon McMillan, sculpture, Fredericksburg; Holly Morrison, photography, North Chesterfield; Julia Pfaff, crafts, Richmond; Russell Richards, sculpture, Charlottesville; Rebecca Silberman, photography, Gordonsville; and Sasha Waters-Freyer, film and video, Richmond. Hamza Walker, director of Laxart in Los Angeles, California, was the juror for the professional fellowship entries. Multiple Exposures Gallery presents a new exhibit of work by Soomin Ham: "Portraits and Windows" This exhibit will be on view from January 2 through February 11, 2018, with an opening reception to be held on Sunday, January 21, 2018, 2-4pm. The new exhibit includes two photographic series, “Portraits” and “Windows.” Ham’s new work is a visual narrative emerging from her efforts to understand and interpret rediscovered photographs that her grandfather made in the 1930s. Using imagination and building upon fading memories, Ham creates new work as reconstructed compositions where past and present coexist and resonate. Here, photography becomes a window to collaboration over place and time, between Ham and her grandfather, merging his creative vision and her own. When she was young, Soomin Ham had a fear of losing her parents. In 2009, her mother committed suicide, and Ham’s recent photography and video work, now on display at the Art League in Old Town Alexandria’s Torpedo Factory, powerfully addresses loss and memory. As I spoke with Ham about her work yesterday, I felt we both had trouble holding back tears. Her evocative photography takes family photos and objects that belonged to her late mother and imbues them with an incredibly poignant sense of fleeting time and memory. In the “Back to Heaven” series, named for one of her mother’s favorite Korean poems, the ephemeral images seem to fade before your very eyes. In her multimedia exhibit “Sound of Butterfly,” D.C.-based artist Soomin Ham ingeniously blends form with theme. Her Flashpoint Gallery exhibit dwells on themes of grief and loss, specifically Ham’s loss of her mother. She channeled her heartache by sifting through her mother’s possessions and photographing them. The items themselves are prosaic–articles of clothing, a watch, bottles of pills, even her mother’s fingerprint on a jar. Other images depict scenes with special meaning for Ham, such as the highway turnoff sign for the memorial park where her mother was laid to rest. It’s Ham’s artistic treatment that makes them exceptional. 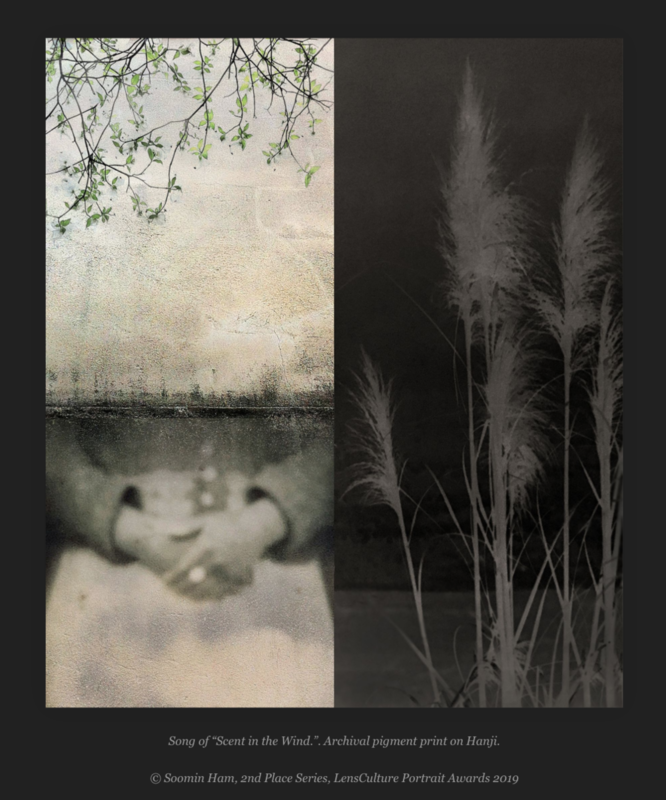 In one series consisting of more than two dozen square images, Ham starts with a photograph of one of her mother’s possessions, then freezes it in a layer of ice before re-photographing it. The resulting work both deadens the clarity of the image and adds a sprinkling of air bubbles around the edges, producing something almost mystical. A second series is even more engrossing. It consists of a dozen reproductions of old family photos–vacations, weddings, group portraits. Ham scanned these images, printed them on rice paper, left them in water, then washed and dried them repeatedly until the images became murky. Then she left them out in the falling snow and photographed them again when they were almost covered. The resulting images are visually stunning–the complex process dulls individuals’ faces to blankness and turns panoramic views into indistinct, pictorial fantasies seemingly photographed using 19th century paper negatives. What gives these works added power, though, is the idea that they have been defined as artworks by something as ephemeral as snow or ice. The result is as eloquent as it is elegiac. Through April 30 at Flashpoint Gallery, 916 G St. NW. Wed-Sat 12 p.m.-6 p.m. The Luce Artist Talks series brings in local artists to discuss their current projects in relation to the objects on view in our Luce Foundation Center. Photographer and multi-media artist Soomin Ham will speak about her on-going project, "Sound of Butterfly" on April 17 at 1:30 p.m. This series is presented in collaboration with CulturalDC's Flashpoint Gallery. What happens to our bodies after we die? Are ghosts real? Throughout time, humans have striven to understand death and loss and express our grief in a meaningful way. We also look to remember those who have died and honor their memories in both very public and private ways. These themes are especially prevalent in art and many examples can be found in SAAM's collection. In the Luce Foundation Center alone, we have mourning miniatures from the late 18th to mid-19th century. These tiny portraits might be surrounded by pearls that represent tears or incorporate a lock of the deceased's hair, which served as keepsakes for a lost loved one. By the 19th century, the tradition of creating a death mask had become a popular way to preserve a loved one's likeness, like one sculptor Hiram Powers made of his son. We also have early 20th-century memory vessels, delightfully elaborate pieces that grew out of a grave-marking or commemorative tradition found in several cultures. In the twenty-first century, DC-based artist Soomin Ham combines old home movies, family photographs, and audio recordings in an exploration of her mother's life and death in "Sound of Butterfly." Ham also includes photographs of everyday objects, which she washed and froze before photographing, that belonged to her mother. These photographs are intended to preserve objects that would have otherwise disintegrated over time. The installation not only helps Ham come to terms with her loss and preserves precious memories, kind of like a contemporary memory vessel. Ham's talk on April 17 will discuss how intensely personal experiences affect her work and relate her art to those on view in the Luce Foundation Center. Afterward, guests are invited to visit Flashpoint Gallery to experience "Sound of Butterfly" for themselves.